The Wollombi Brook bridge is a heritage-listed road bridge at 213 Main Road, Bulga, Singleton Council, New South Wales, Australia. It was designed by Harvey Dare and built in 1912. 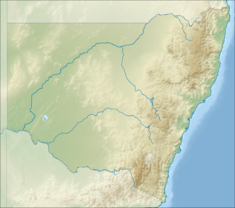 The property is owned by Roads and Maritime Services, an agency of the Government of New South Wales. It was added to the New South Wales State Heritage Register on 20 June 2000. Timber truss road bridges have played a significant role in the expansion and improvement of the NSW road network. Prior to the bridges being built, river crossings were often dangerous in times of rain, which caused bulk freight movement to be prohibitively expensive for most agricultural and mining produce. Only the high priced wool clip of the time was able to carry the costs and inconvenience imposed by the generally inadequate river crossings that often existed prior to the trusses construction. Timber truss bridges were preferred by the Public Works Department from the mid 19th to the early 20th century because they were relatively cheap to construct, and used mostly local materials. The financially troubled governments of the day applied pressure to the Public Works Department to produce as much road and bridge work for as little cost as possible, using local materials. This condition effectively prohibited the use of iron and steel, as these, prior to the construction of the steel works at Newcastle in the early 20th century, had to be imported from England. Harvey Dare, the designer of Dare truss and other bridges, was a leading engineer in the Public Works Department, and a prominent figure in early 20th century NSW. Timber truss bridges, and timber bridges generally were so common that NSW was known to travellers as the "timber bridge state". The bridge was built in 1911-12 by William Murphy and James Taylor over what was then known as Cockfighter Creek. In 2003-04, emergency works were undertaken including pier replacement, driving of new piles and a second row of piles. Bulga Bridge is a Dare type timber truss road bridge. It has 2 timber truss spans, each of 32.0m (105ft). There are 3 timber approach spans at one end and 2 at the other giving the bridge an overall length of 129.2m (424ft). The super structure is supported by sheeted timber trestles and provides a carriage way with a minimum width of 5.5m. A timber post and rail guard rail extends the full length of the bridge. The underside of the bridge deck has been strengthened with steel tension ties. The Bulga bridge is a Dare type timber truss bridge, and was completed in 1912. In 1998 it was in good condition. As a timber truss road bridge, it has many associational links with important historical events, trends, and people, including the expansion of the road network and economic activity throughout NSW, and Harvey Dare, the designer of this type of truss. Dare trusses were fifth in the five stage design evolution of NSW timber truss road bridges. They were similar to Allan trusses, but contain improvements which make them stronger and easier to maintain. This engineering enhancement represents a significant evolution of the design of timber truss bridges, and gives Dare trusses some technical significance. The Bulga bridge is particularly technically significant because it has very large supporting trestles, has the rare feature of trussed cross girders, and is the largest span Dare truss bridge built. The bridge is located in the Hunter region, which has 15 historic bridges each constructed before 1905, and it gains heritage significance from its proximity to the high concentration of other historic bridges in the area. In 1998 there were 27 surviving Dare trusses in NSW of the 40 built, and 82 timber truss road bridges survive from the over 400 built. The Bulga bridge is a representative example of Dare timber truss road bridges, and is assessed as being Nationally significant, primarily on the basis of its technical and historical significance. Bulga Bridge over Wollombi Brook was listed on the New South Wales State Heritage Register on 20 June 2000 having satisfied the following criteria. Through the bridge's association with the expansion of the NSW road network, its ability to demonstrate historically important concepts such as the gradual acceptance of NSW people of American design ideas, and its association with Harvey Dare, it has historical significance. The bridge exhibits the technical excellence of its design, as all of the structural detail is clearly visible. In the context of its landscape it is visually attractive. As such, the bridge has moderate aesthetic significance. Timber truss bridges are prominent to road travellers, and NSW has in the past been referred to as the "timber truss bridge state". Through this, the complete set of bridges gain some social significance, as they could be said to be held in reasonable esteem by many travellers in NSW. ^ a b c d e f g h i j k l m n o "Bulga Bridge over Wollombi Brook". New South Wales State Heritage Register. Office of Environment and Heritage. H01459. Retrieved 13 October 2018. ^ "LOCAL. NEWS". Singleton Argus. New South Wales, Australia. 4 May 1911. p. 2. Retrieved 30 October 2018 – via National Library of Australia. "Bulga Bridge over Wollombi Brook". 2007. Attraction Homepage (2007). "Bulga Bridge over Wollombi Brook". Department of Main Roads, NSW (1987). Timber Truss Bridge Maintenance Handbook. Fraser, D J (1985). Timber Bridges of New South Wales. This Wikipedia article was originally based on Bulga Bridge over Wollombi Brook, entry number 1459 in the New South Wales State Heritage Register published by the State of New South Wales and Office of Environment and Heritage 2018 under CC-BY 4.0 licence, accessed on 13 October 2018. This page was last edited on 28 December 2018, at 00:47 (UTC).